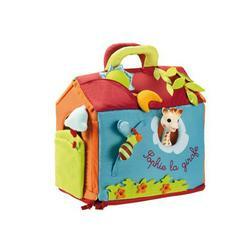 A convertible house with many learning activities for baby! - A discovery space to help develop the babys senses. - An area with many different activities to help baby develop his sense of imagination and mimic everyday movements. - A house which can be carried with baby wherever he goes. Comes with Sophie the giraffe. Made entirely of fabric for safer play.